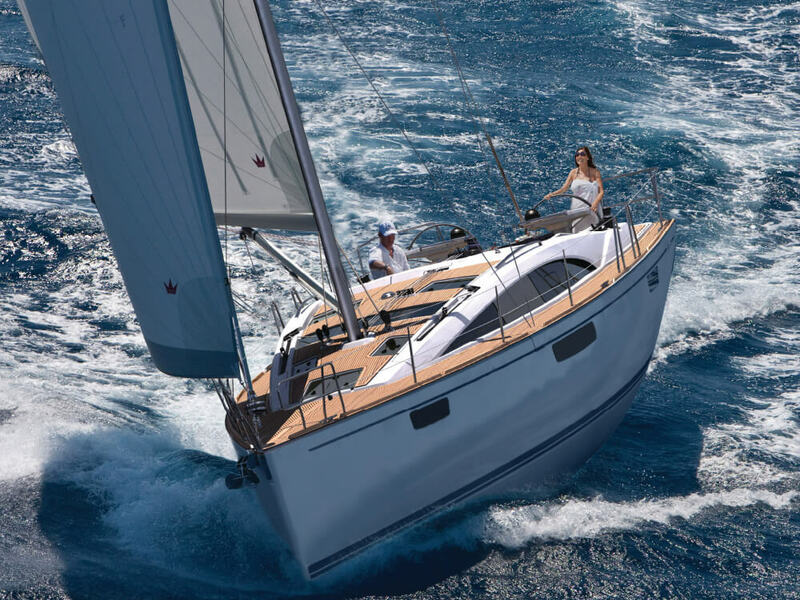 In 2013, looking to establish a more up-market sailboat line to compliment its mainstream Cruiser line, Bavaria unveiled the Vision 46, followed soon after by the Vision 42. These two new models were, in many ways, ahead of their time. Even three years later, they come across as avant-garde when compared with most other production cruising sailboats. Moreover, from a commercial perspective, they continue to sell as briskly as ever. Pacific Yachting reviewed the Vision 46 in 2014, but in view of continuing popularity, it seemed worthwhile to revisit the line. Compared to the 46, the Vision 42 discussed here is 1.2 metres shorter, 14 centimetres narrower, and at 9,800 kilograms unladen displacement, over 20 percent lighter. All the same, the 42 doesn’t feel appreciably smaller than the 46, primarily because its saloon and galley areas are very nearly as voluminous with towering headroom and an abundance of natural lighting. The most significant differences between the two is available layouts: the Vision 46 offers two heads and a three cabin option, while all 42s come with two cabins and single forward head. Design and Construction Like other recent Bavaria models, the Vision 42 is the product of close cooperation between Farr Yacht Design, headquartered in Annapolis, Maryland, and Design Unlimited of Hampshire, England—the latter best known for super yacht designs. With this sort of pedigree, there’s every reason to expect something a bit special, and the Vision 42 does not disappoint. The hull form is clean with ample rocker to support a healthy cruising load without succumbing to transom drag. No trendy chines in this case (and with a conservative displacement-to-length ratio of 184 it’s unlikely they’d boost performance in any event). But what moderate displacement does for a cruiser is allow for substantial loading with only minimal performance loss, while at the same time, making for a quieter motion in choppy seas. Thanks to a generous rig (SA/D of 19.5), there should still be sufficient power on tap to move this 42 quite well in lighter winds. As for exterior styling, the Vision 42 offers a streamlined “bubble-type” cabin that fairs seamlessly into aft-sloping cockpit coamings. The look is not entirely novel—quite a few other boats now offer similar styling features—but it’s nicely executed, far from extreme and unlikely to look dated anytime soon. Where Vision 42 (as well as the 46) really departs from mainstream design practice is in the creative use of asymmetry to improve functionality in the cockpit and below-decks areas. The companionway is offset to starboard—seemingly a small distinction but one that has surprisingly profound ripple effects both above and below. Construction for the Vision 42 is largely the same as in Bavaria’s Cruiser line, but considering that build quality is a major strong point for this German brand, that’s by no means a bad thing. One noteworthy upgrade, however, is the use of tempered glass windows in the Vision 42 instead of the acrylic ones used in the Cruiser line (as well as the great majority of competing sailboats). The difference won’t be noticeable in the first few years, but over time the softer acrylic inevitably gets dulled, and even careful polishing never quite restores it 100 percent. or serving up an elaborate meal. The same table comes equipped with an electric retractable pedestal so it can be lowered to the level of the cockpit seats to form a spacious sun lounge. The Vision 42 features a sizeable, fold-down transom platform with a retractable secondary step to make access easy. A section of the aft helm seat hinges up for walk-through stern boarding, and there’s even an integral bracket for the swim grid shower. Moving forward, the side deck walkways are ample and flanked by teak toe rails for security. Hand grabs along the edges of the cockpit seem OK, but a bit short, so some people won’t have enough arm span to reach the shrouds without letting go. As is often the case with today’s boats, the lower shrouds cut across the walkway often making it easier to step up to the cabin top before proceeding forward. Controls from the mast base are mainly lead down the centre of the cabin, so the cabin top itself is very clean and unobstructed. Of course there are plenty of big skylights and hatches—very slippery when wet—so crew will need to take some care. At the very bow is a massive stainless steel fitting that combines the anchor roller, headstay terminal and gennaker tack fitting in a single, well-designed unit. Lifting the bow hatch reveals a vertical electric windlass and a sizeable locker easily sufficient for several hundred feet of chain. Systems At first blush, the engine installation looked unusual because the hinged companionway cover is offset to starboard, so lifting it reveals only the right side of the 40 horsepower Volvo diesel. Maintenance access is no problem, however, because the rest of the engine and sail drive can be reached via removable panels at the back and port side of the enclosure. Under power, the Vision 42 proved laudably quiet: 68 dBA cruising at 2,600 rpm at a speed of 7.3 knots, and 72 dBA running WOT at 3,100 rpm at a speed of 7.9 knots. Plumbing and electrical installations are generally accessible with quite a few of the heavier items such as house batteries and hot water tank situated centrally beneath settees. The refrigeration unit in the starboard galley should see adequate air flow, and the twin sinks are ideally located exactly on the midline. Interior Again, thanks to that offset companionway, the Vision 42 gains an exceptionally serviceable aft galley because there’s extra space to work with on the port side of the vessel. As a result, the double (large/small) sinks are located on a substantial island cabinet amidships while a large, L-shaped counter envelops the cook on two of the remaining sides. The walkway between is not very wide, but experienced sea cooks know that it’s much safer to be well braced when at work in a seaway than to risk a long fall across wide-open space. The front/side opening refrigerator is enormous, and the adjoining freezer is also quite generous. Galley stowage should prove quite sufficient (although naturally, there’s never quite enough). Ahead of the galley is an ingenious nav station featuring a compact table that lowers to establish a full-length starboard settee. Opposite is a sizeable dinette with a central table that can be lowered to create an extra double berth. The port side aft cabin extends all the way beneath the cockpit sole creating space enough for something close to a king-sized berth that can also be configured as a pair of twins. The owners’ cabin forward offers an island double and direct access to the boat’s only head—generously sized with separate shower area. Personally, I’m no great fan of multiple heads on boats much smaller than 45 feet because they eat up space, require extra maintenance and don’t see a lot of use. Furniture aboard the Vision 42 is a cut above what’s seen in Bavaria’s Cruiser line with some nice details such as round-cornered fiddles milled from solid wood stock. The review boat featured a light oak interior, which was predominantly finished with a manufactured wood product consisting of stacked and re-sliced veneers. The end result bears a close resemblance to a traditional veneer, despite the fact it’s made from relatively small, plantation-grown trees. Thanks to numerous hull side, cabin and overhead windows the Vision’s light-toned interior gets loads of natural light. And at night there’s an abundance of LED interior lighting to keep things bright. About the only shortcoming I noted in the below decks area was actually the result of getting over generous with the headroom. The boat’s specs cite an average of six feet, six inches but where the cabin top arches highest it felt like more than seven feet. This could make the recessed overhead grabs too high for shorter people to use. Under Sail Unfortunately, my test sail aboard the Vision 42 wasn’t blessed with an abundance of wind. In fact, while motoring down the north arm of the Fraser, there was scarcely a breath. Luckily a gentle breeze sprung up toward the river’s mouth, and I was able to establish that the boat is no slouch in light air. Given a maximum of perhaps six knots of breeze, we achieved a peak speed of 4.2 on a reach and around three knots close hauled. Considering we were dragging a three-bladed, fixed prop, it was a pretty decent performance—a folding prop would have added at least half a knot more. Unfortunately, there was not enough breeze to properly test out the Lewmar Revo in/out power winch system fitted as an option on this boat. Essentially, this is an electric control pad that sheets in the jib on the “new” side during a tack while allowing the opposite-side winch to freewheel so the old sheet can pay out. I’m quite sure it would have worked just fine given a bit more pressure, but the feeble breeze wasn’t quite enough. Concluding Remarks Bavaria’s Vision 42 is a well-designed and nicely-detailed cruiser that will likely appeal both to weekend family cruisers and older couples who might be planning lengthy stays aboard. The luminous interior is an obvious asset when cruising our often-gloomy waters, while the clever use of space that flows from an offset companionway makes for a highly functional cockpit and interior. Keeping in mind that the Canadian dollar is in an exceptional state of flux, at the time of writing there was a lavishly equipped stock boat, available in Vancouver for $379,000. A more basic sailaway might come in closer to $335,000 —very decent value in view of what this yacht has to offer.